I’ve been using a lot of accessories for writing and adventure design lately, among my many tools, a few of my favorites have been the Fourthcore Alphabet and the Deck of Many Things from Madness at Gardmore Abbey. I’ve also been using some miscellaneous bits on things like cryptography, numerology, and puzzles from online sources. Using stuff like this makes for a really interesting mix of dungeon scenarios, plot hooks, fun challenges, and lots of other stuff. 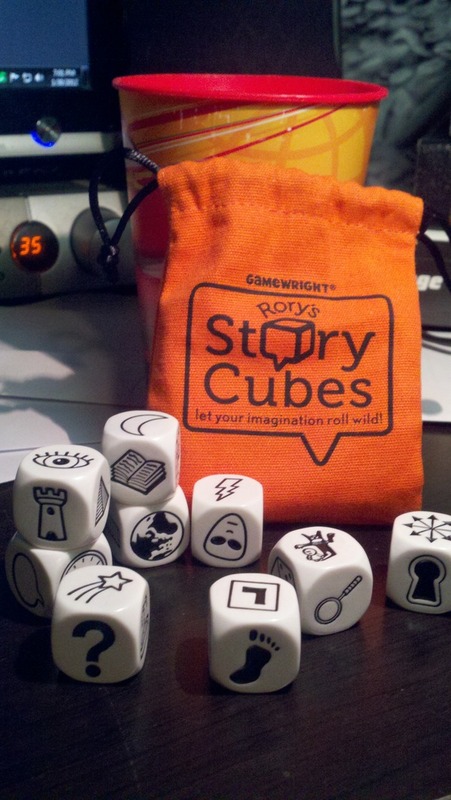 Writer’s Dice seem to compliment the story cubes perfectly, created by Daniel Solis as a kickstarter project – these little things can surprisingly spark away cases of pretty bad writer’s block. Use them when you’re at a loss for words, when you’re not sure what should come next, or various other situations which I’m sure I’m not even thinking of right now. There’s also a mobile app for Writer’s Dice for those of you who who prefer to virtually roll dice (heretics) for Android, iOS, and Windows mobile that you can pick up for $1. I did a short video on the cubes and the writer’s dice if you’d like to check them out in a more intimate manner. I really enjoy using both of these tools when playing with my kids, dreaming up adventures, writing stories, or even designing dungeons. So that’s it for today, in the meantime keep those ideas flowing, and happy gaming! Very cool! I saw these story dice at the store the other day and almost picked them up. Now I will! Those are awesome! I must have them. Also, what kind of perverted freak prefers virtual dice? Thanks for the tip! Not sure that I get the point of the Writer’s Dice–looks like it’s just a handful of conjunctions–but I found the Story Cubes at Target this morning and bought a set!